According to the recently published Vaccine Partnering Terms & Agreements report, throughout the past 5 years there has been a significant increase in vaccine partnering and collaboration. Looking at a figure showing partnering deals from 2007 to 2012, we see a rise in frequency from 2007 with a peak in 2010. Since then, however, there has been a decline in the number of vaccine partnerships and M&A activity. This article is abstracted from the recently published Vaccine Partnering Terms & Agreements report. 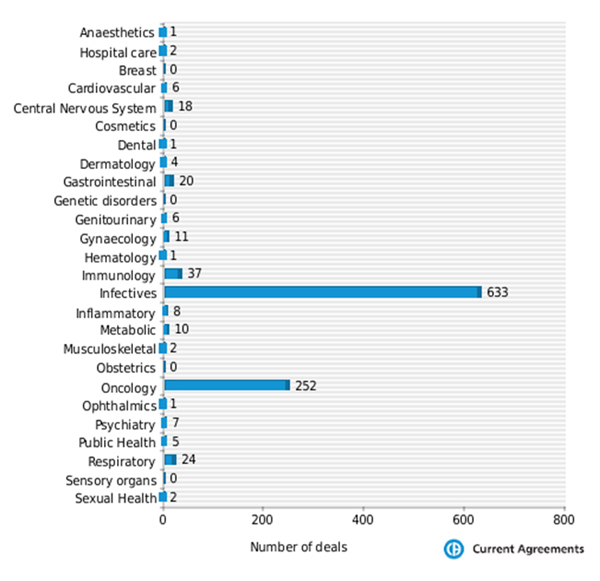 As for vaccine deals by therapy area, from 2007 to 2012, the leading sectors include infectives and oncology. See below.